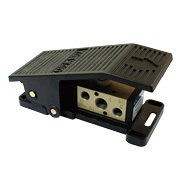 Mechanical foot valves from FT series are perfect solution for controlling pneumatic system with use of pedal. This kind of valve positively increases comfort and dynamics of work. Maximum working pressure is 10 bar. Available flow ranges from 1000 l/min up to 4500 l/min depending on model (size) of the valve. Measurements performed at a pressure of 5 bar. Work temperature from 5 up to 60°C. We do not recommend going beyond this range for a longer time. Pilot parts: Glass Filled Nylon. Foot upper plate: Die-Cast Aluminium. Foot lower plate: Zinc Pressure Die-Cast.